I find myself going through different phases of cleansers and makeup removers. One minute I love creamy cleansers, micellar waters and then I fell in love with balm cleansers. However I forgot to pack makeup remover or cleanser with me when I went home for Christmas so I ended up picking this up on a whim. 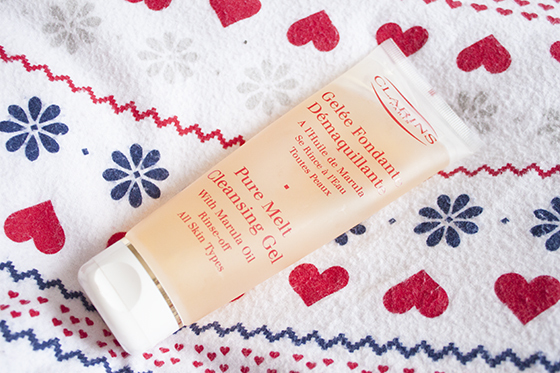 Pure Melt Cleansing Gel is a strange texture, it's a really slippy light gel but soon turns into luscious oil when applied onto the skin. To use, you start by applying a small ammount (about a 10p piece or less) on to dry skin. I tend to start with my face and then do my eyes, then I give myself a mini facial massage for a minute, splash on some water and then take a warm cloth and wipe off. It leaves my skin feeling so clean and soft without stripping it of moisture or leaving residue behind. I occasionally double cleanse using this as it leaves my face feeling so fresh and clean. I absolutely love this makeup remover. It's gentle on the skin, removes every trace of makeup, doesn't irritate my eyes and most importantly it hasn't broken me out. I can rave about this cleanser enough and it's definitely going to be one I'm sticking with for the time being. I have absolutely no issues with it at all and I think for the price it's pretty good value as I expect it to last a good while.